The radiology report is the final product upon which the profession is judged. The traditionally text-based answer to a clinical question has remained unchanged for decades. Now the profession is facing external pressure from those who seek to commoditize the process. As such, the lines between private and academic practice are becoming increasingly blurry. Amidst competition from various sources and continual threats to professional reimbursement, several solutions can help radiologists provide exceptional value in their services and set a new direction for how they will interact with their customers. This 2-part article will discuss some of the strategies that radiologists are employing to add value. The tools include advanced visualization to provide more interactive treatment-planning functionality, structured reporting to create simpler reports with concise data, and critical results communication tools to better manage how urgent or unexpected results are transmitted. These seemingly disparate components are being rolled into larger efforts to create longitudinal health records delivered through the electronic medical record (EMR), and they will become a valuable piece of the overall patient picture. In the past, advanced visualization (AV) had been a series of niche-specific tools but with the advent of thin-client solutions that eschewed expensive, standalone workstations (thick clients), the technology is branching out beyond radiology. Thin clients generally are full-featured software applications, but the processing occurs on a central server where the images are stored. In an environment where scalability and cost containment are major pain points, being able to easily deploy these solutions across the enterprise will increase their adoption. Part of this effective delivery means employing information technology (IT)-friendly strategies. Chiefly IT departments prefer not to manage workstation-specific hardware, according to Chang. In the past, much of the AV rendering relied on high-powered graphics processor units (GPUs) even in some of the thin-client solutions. With the rendering now taking place on the server and being pushed to thin clients, the need for dedicated GPU technology is mitigated. 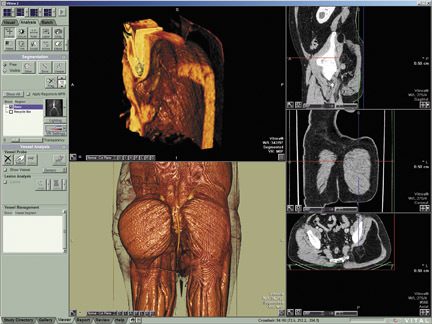 Thin-client architecture has allowed the delivery of these tools to radiologists at their primary reading workstations. But when delivering the tools outside of radiology in this manner it becomes necessary to further minimize steps by employing forms of intelligent image processing. Increasingly vendors are offering solutions that can optimize the tools and the images before radiologists review them. In this way the burden on end users is reduced. Ziosoft tailors its application to the specific type of case. So instead of having one orthopedic AV application, discrete instances can be created for the ankle, knee, hip or spine. TeraRecon (San Mateo, CA) also uses automatic preprocessing with a software-based technology that works in conjunction with its 3-dimensional visualization system. According to Jeff Sorenson, Vice President of Aquarius Sales, the company considers this functionality similar to what one would expect of a 3-dimensional technologist (3D tech). In the industry, numerous picture archiving and communications systems (PACS) vendors are now integrating AV tools directly onthe radiology workspace. Instead of launching a separate application that pulls a separate worklist, the full functionality and power of an AV client is available in a tab while reading images. When looking at the value of an AV solution, the primary challenge in the past had been managing patient worklists among thick-client workstations or less-than-thin clients that resided on the PACS workstation but that pulled information from separate worklists. New offerings are providing context-sensitive, unified worklists. Bringing these systems into unison makes it possible to keep the radiologist’s tool set similar no matter where he is reviewing images. So for an interventional radiologist like Henry Krebs, MD, of Atlanta Radiology Consultants and Saint Joseph’s Hospital, the same tools at the primary reading workstation are available in the computed tomography (CT) control room. With the efficiency and delivery components addressed by today’s offerings, the tools are allowing radiologists to change the way they interact with their customers. Using an AV system from Carestream Health (Rochester, NY), Rodney Shaffer, MD, a Neuroradiologist at St. John Medical Center, Tulsa, OK, is finding new ways to handle stroke and aneurysm imaging. The solution from Carestream allows Dr. Shaffer and colleagues to perform all of the AV functions they would have done on a separate workstation or in a separate application by merely clicking a different tab on their primary reading workstations. If they receive the correct toolset, physicians are more likely to rely on the tools first to render the views they need and an additional phone call to radiology will likely lead to a more streamlined, informed discussion. With AV tools moving out of the diagnostic room and onto the referring physician’s desktop, they will be further implemented into the EMR, where embedded links can take users to a feature-rich Web viewer. However, the paradigms in radiology that have moved the profession away from using a dedicated workstation for AV functionality are even more important in an enterprise setting. “These individuals, more so than a radiologist, do not want to go to a separate workstation to view reconstructions,” said Erkan Akyuz, Vice President of Research and Development, Vital Images, Minnetonka, MN. So these tools are operating in what Vital Images terms a “zero-footprint” client. If the tools will be pushed through EMRs, AV vendors need to be considerate of institutional policies. For instance, many hospital networks are controlled so tightly that users can not install Web applets. Essentially, the AV tools need to run entirely from the server in order to ensure true enterprise interoperability. This methodology will create a new way in which radiologists and their customers will interact. Imagine a workflow where a referring physician could add studies back to the worklist with more intuitive clinical questions. Perhaps saving a portion of their own reconstruction with a new question like, “How do I avoid important nerves in this particular procedure?” Better yet, imagine if the referring physicians had real-time access to these tools during their procedures. The radiologist could review a small portion of the volume, highlight the nerves and explain the answer to the clinical question with various multimedia approaches. “This is a whole different level of service that is consumer-driven rather than producer-driven,” said Akyuz. With any new piece of clinical information comes the possibility of overburdening the end user, so information must be delivered in a user-specific, context-sensitive manner. At The University of Pittsburgh Medical Center (UPMC), Pittsburgh, PA, the Informatics Department is developing a next-generation EMR that will incorporate images and information from a variety of sources. There is general agreement that such a system should be a patient-centric evidence-based data-aware application. Subsequent to this, the system should allow for information extraction and structuring. The goal would be to extract the appropriate information from various healthcare silos and provide access to actionable data. Traditionally, radiologists have been seen as providing more of a clinical road map for surgeons and clinicians. If the old form of the radiology report is like a printed map in an atlas, radiology has since evolved to providing a service more akin to printing directions from Google Maps. The document can provide point-to-point guidance but is not completely interactive. Besides becoming an integral part of the patient report, AV systems are also playing a potential role in lowering the radiation dose required to obtain a diagnostic study. Several vendors are evaluating ways to use AV systems to reduce the noise in images and render higher quality products at lower dose penalties. The potential benefit here is for those frequent fliers, who may need numerous CT studies. In these instances, if multiple studies are needed, they could theoretically be ordered at a lower dose and the studies could still be of diagnostic quality. Dr. Taylor likened this novel class of AV products to catalytic converters on automobiles—the devices began as optional components but eventually became requirements because of their protective benefits. Clearly these radiology systems are poised to bring dramatically new levels of information and interaction to medicine. Radiologists can leverage these tools to optimize processes, procedures and, ultimately, patient care decisions. Part 2 of this article will be published in October and will focus on how radiology is closing the loop at the end of the reporting process by using tools like radiology lexicons, structured reporting, voice recognition and critical results communications systems. 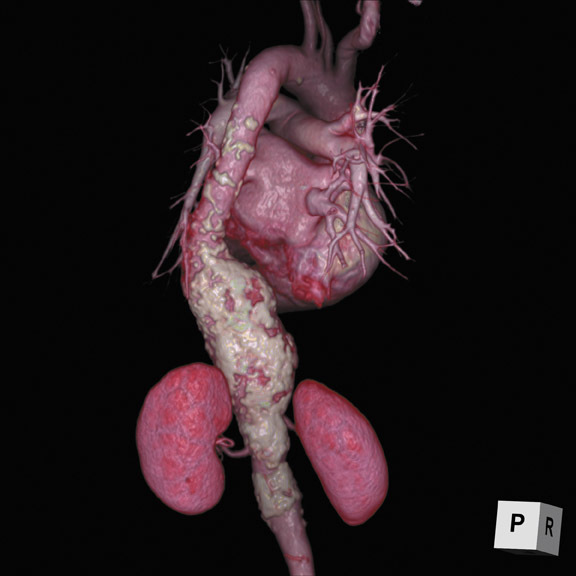 Adding Value in Radiology, Part 1 Advanced Visualization. Appl Radiol.